Next to our hostel is a giant kiwifruit statue which, depending on your direction, is either a green slice or a gold one. Inside the statue a staircase leads up to an outdoor platform with a panoramic view of the parking lot. I’m not sure what the architect’s intention was, but at least they had the foresight to break up the asphalt with a few flowering trees. 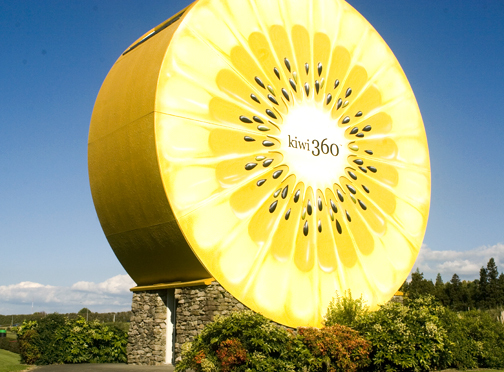 Across from the jumbo sized kiwifruit is the Kiwi 360 gift shop. As the town’s main attraction it tries to turn backbreaking agricultural labor into an exciting experience. There are tram tours through orchards and packhouses and if that isn’t exciting enough, there’s even a helicopter tour. I know it’s a short trip though because I hear it roar overhead every time it departs or returns. However, it was a lazy Sunday and Barret and I weren’t looking for expensive thrills. We entered the gift shop craning our necks around possum fur sweaters and kiwifruit chocolate until finally we saw what we had come for- kiwifruit wine. The saleswoman opened a chilled bottle at the register and directed us to the wine glasses without making us feel like early afternoon alcoholics. In the café downstairs Barret even found a blanket and voila, we had a sunny afternoon picnic on the grass. The wine was light and clear like a Riesling. 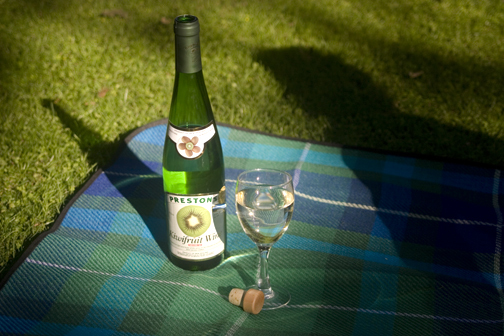 Its crisp and sweet flavor was punctuated with floral notes and a delicate kiwifruit aftertaste. We might have been outside a gift shop, but it felt like the Seine- relaxing and romantic. Why can’t all work days start like this?